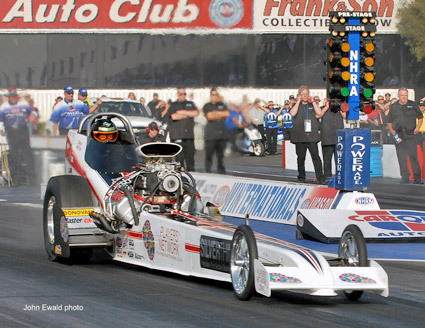 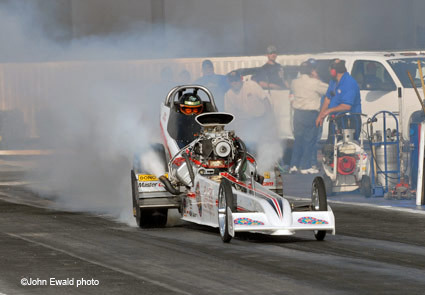 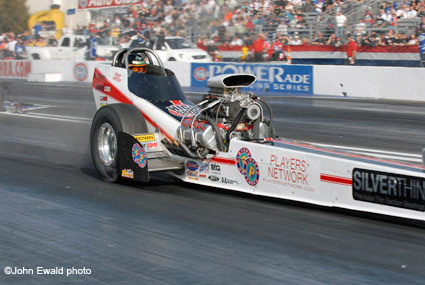 02-09-11-07: For the first time in history, four hand picked Nostalgia Top Fuel Dragsters were invited to do exhibition runs at the season opening NHRA Winternationals. 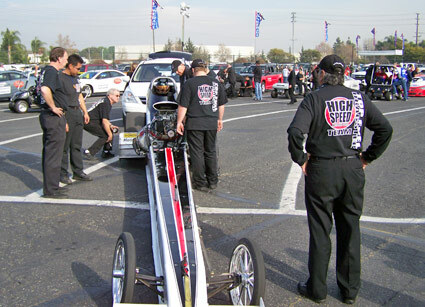 The High Speed Motorsports team was among the cars chosen. 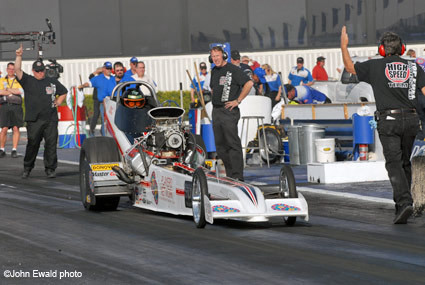 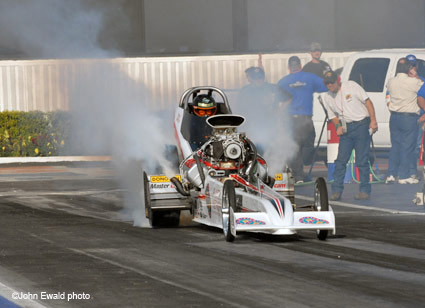 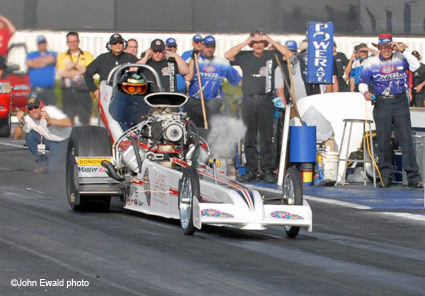 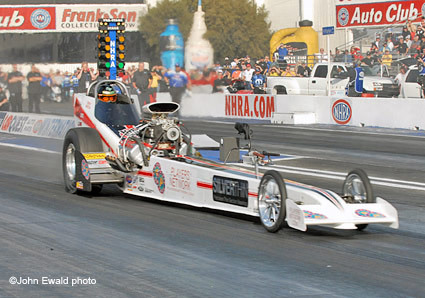 Although rain foiled Sunday's runs, on Saturday Troy Green did wheel the Silverthin Bearing - Players Network Top Fuel Dragster to an impressive, shut off early, 5.94 before a crowd of over 25,000 appreciative fans. 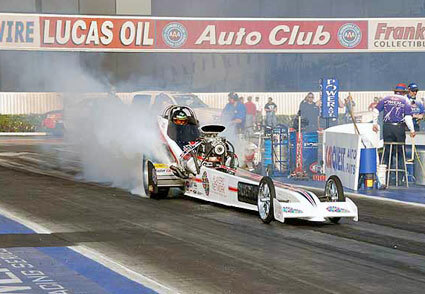 It was a unique opportunity for the awesome Nostalgia Top Fuel cars to showcase their performance before a crowd that would not normally see them. 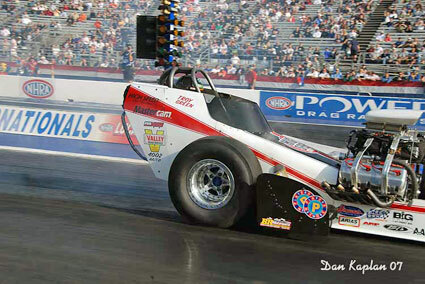 By all accounts they were a huge hit. 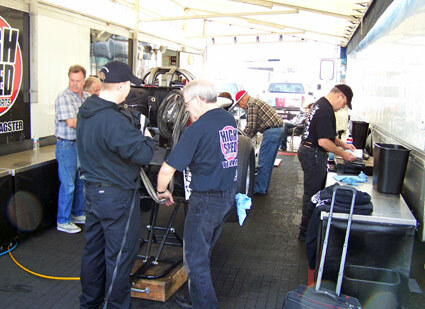 Due to the fact that NHRA national events are a matter of logistics and careful planning, most of the teams are in their assigned pit area by Wednesday... including exhibition cars. 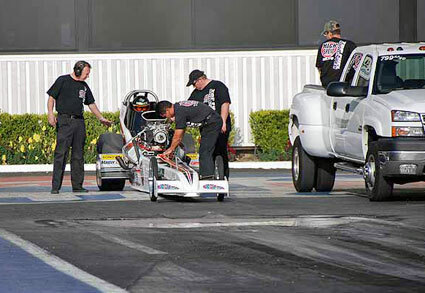 Since they were only scheduled to make two runs over the weekend (one Saturday and one Sunday) the High Speed camp wasn't set up until Friday when the entire team arrived. 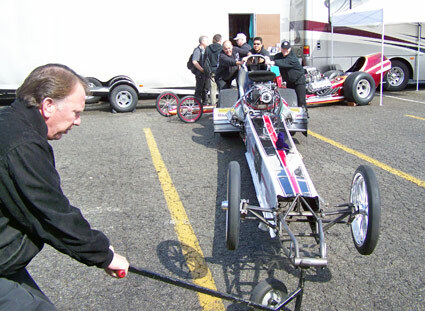 With no scheduling demands, the day was spent going over the car and checking out new equipment. 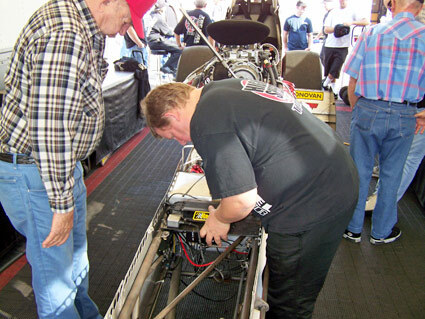 Crew Chief Brett Johansen installs a new RacePak data computer that is used to gather a multitude of information that aids in tuning the car from run to run. 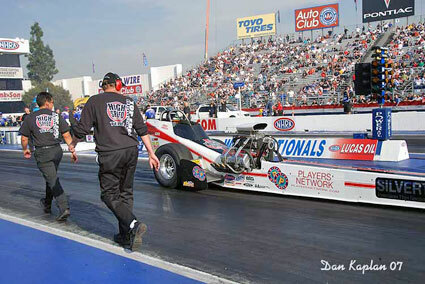 Troy and his dad, Gorman pack the chutes that are always left unpacked when the car is between events. 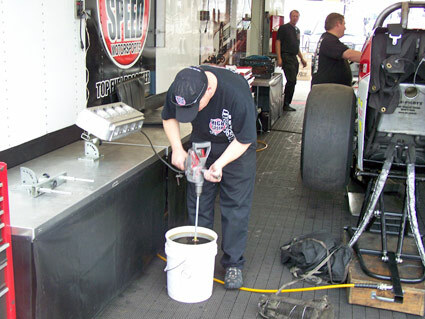 This is done to make sure they don't get moist and/or "clogged" in the packs which happens over a period of time. 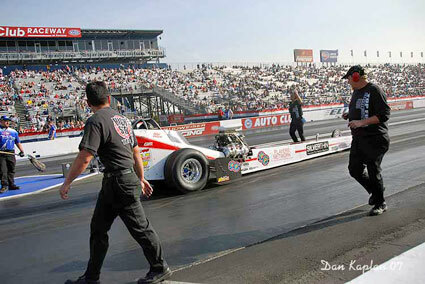 Troy, subbing for the absent Bert Toulette, pre mixes and heats the engine oil for a warm up. 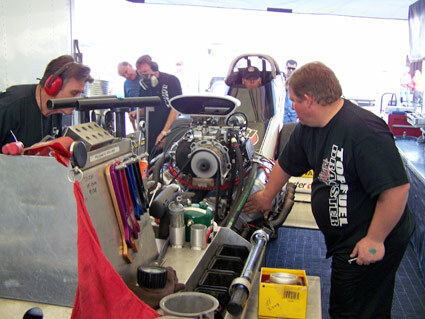 Later in the afternoon the engine was fired up to check for any potential problems before game day. 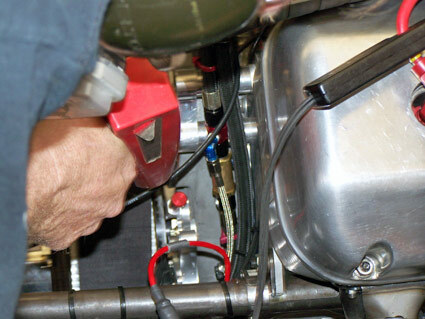 Tom Shelar checks the timing off of the crank trigger (below). 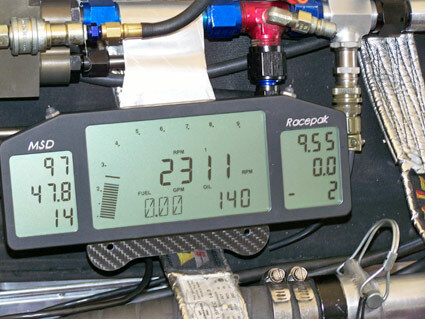 As the engine warms up, Johansen monitors the engine functions on the teams new Racepak "dashboard" (below). 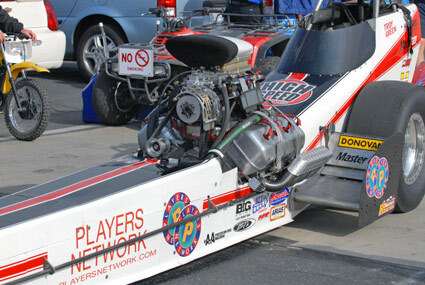 This is the same unit used on the NHRA "Big Show" cars. 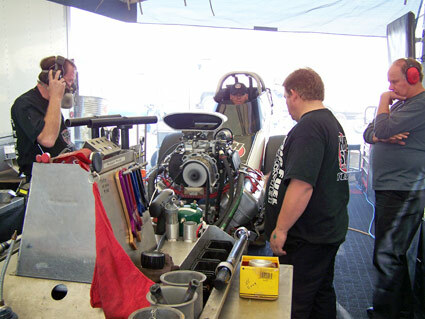 It is called a dashboard because that is exactly where it's located in the cockpit of the rear engine Top Fuel cars. 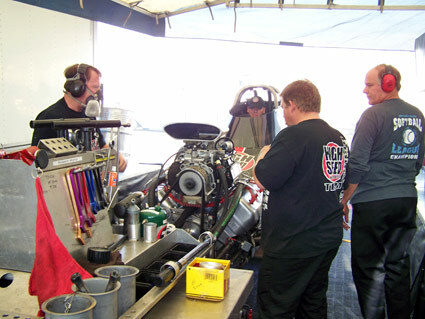 In the Funny Cars it is mounted between the fuel tank and engine and is the last thing crew chiefs look at before the body is lowered for a run. 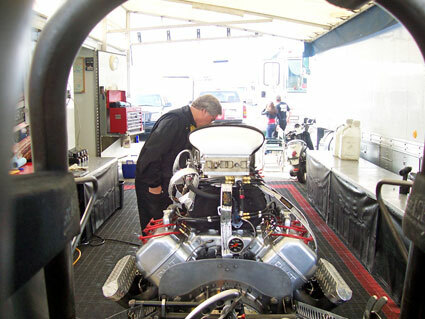 Since Johansen couldn't easily see the unit inside the front engine cars cockpit he cleverly adapted it to hang on the left side of the supercharger. 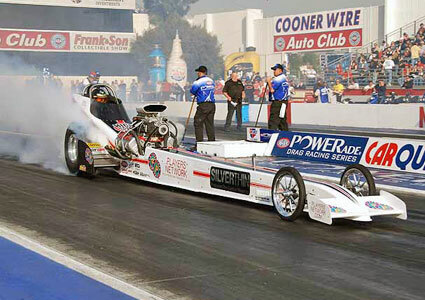 As dark falls over the Pomona facility the car is buttoned up for Saturday. 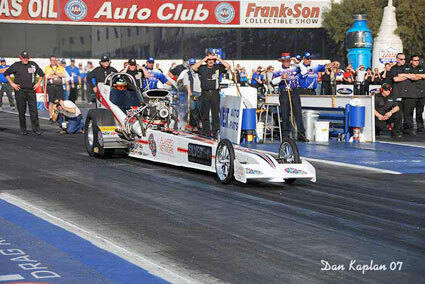 Saturday afternoon and it was show time. 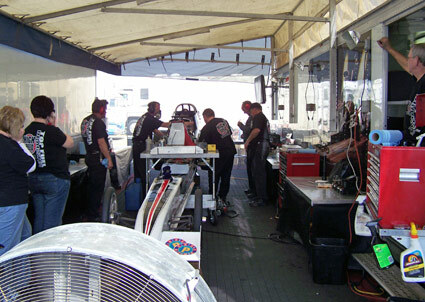 The car is rolled out of the pits for its short trip to the staging lanes. 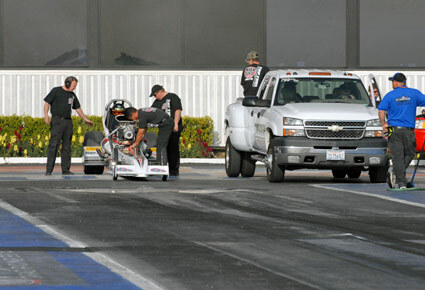 Troy Green, in tow, guides the car through the staging lanes. 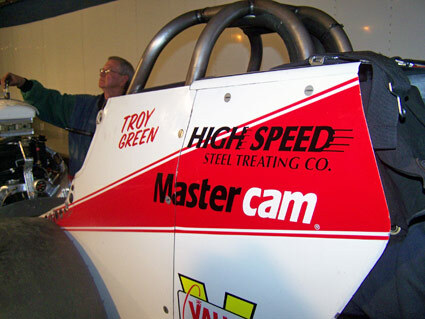 Green happy and confident prior to his official debut as the teams new driver. 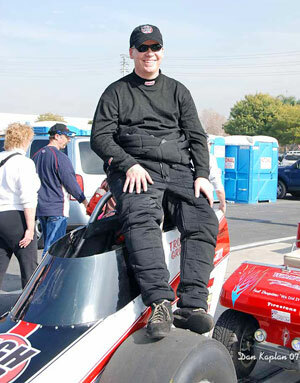 Troy is more than capable of filling the shoes of Sean Bellemeur who graduated to a contract ride in an NHRA Top Alcohol Funny Car for the 2007 season. 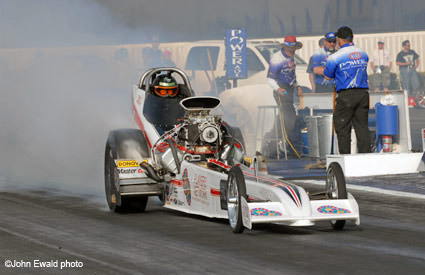 With Green suited up and strapped in, Ryan Kono backs down the engine prior pulling to the head of staging. 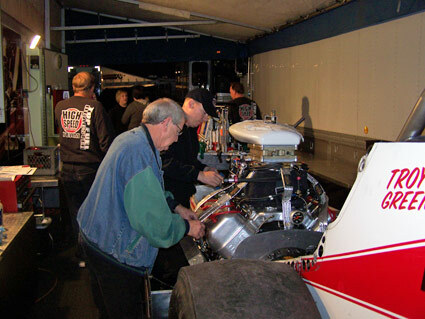 Dale Singh oversees the crew as a final check is made prior to pulling out to the track. 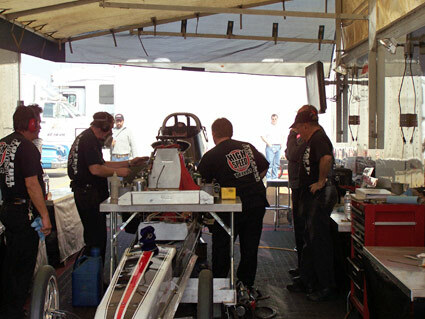 With the car in place behind the water box the team waits for the signal to fire up. 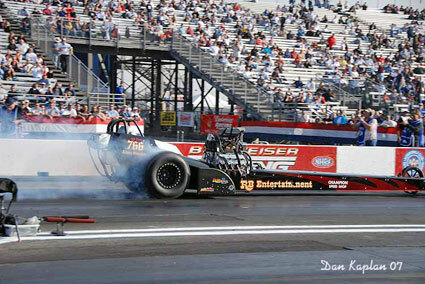 With the engine lit, Johansen lets the engine get a little heat before sending Green into the water box for his burnout. 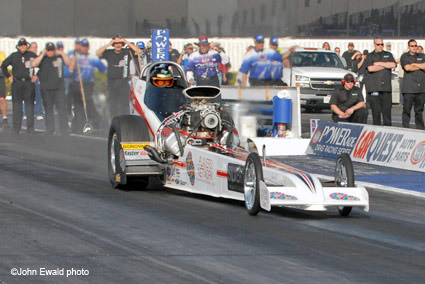 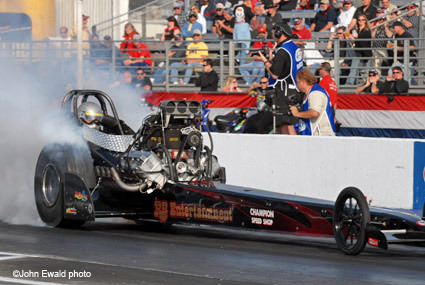 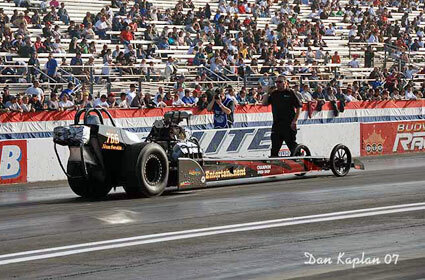 Green was paired with Adam Sorokin in RB Entertainment/Champion Speed Shop black fueler. 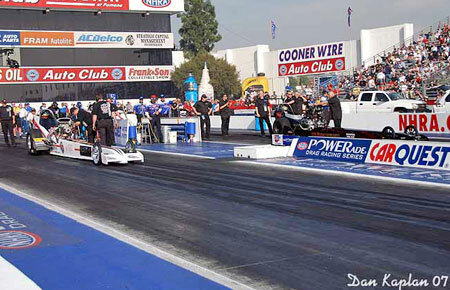 After their respective burnouts both cars are backed up into their "tracks". 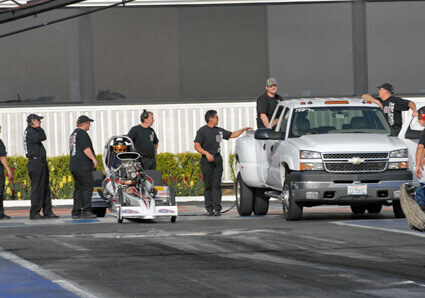 As always, Green is backed up by Walt Stevens and observed by Roger McMartin and Ryan Kono. 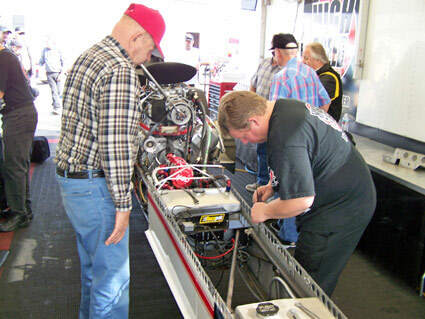 Tom Shelar brings Green into the staging beams as Brett Johansen prepares to pull the idle plug from the injector (below). 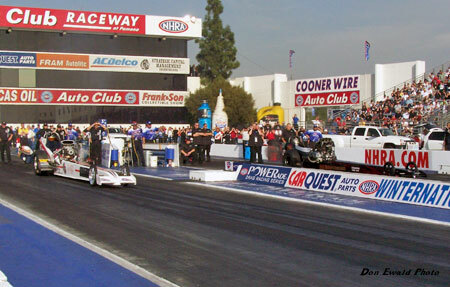 Both drivers left together filling the Pomona facility with the sound of 6000 horsepower on nitro. 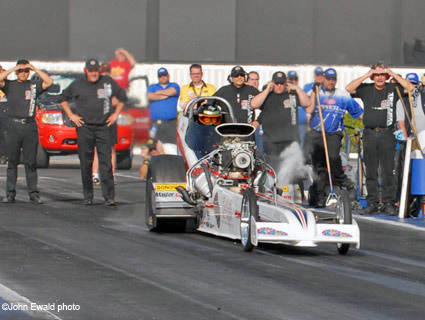 It was a great drag race until Green experienced oil in his face at the 1000 foot mark forcing him to shut down early to a 5.94 at just 229. 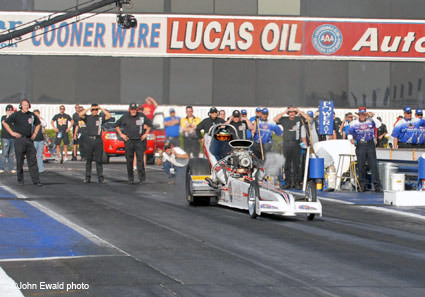 Sorokin clocked a great 5.71 at 261. 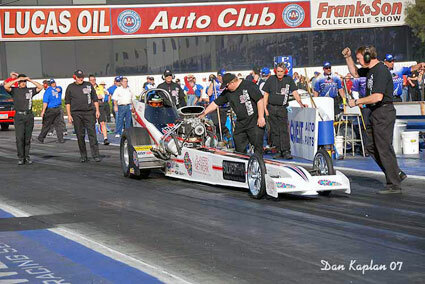 The crowd went wild. 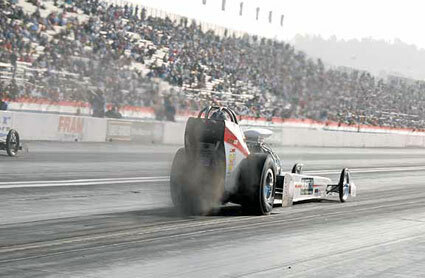 It is hoped this impressive exhibition will spur even more interest in the rapidly growing nostalgia arm of drag racing. 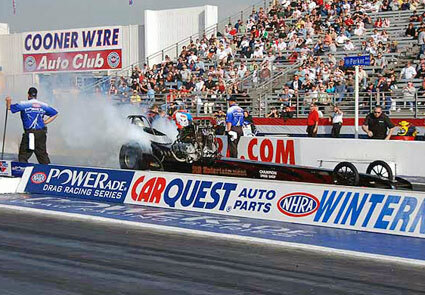 If a picture is worth a thousand words these explain why the Sunday schedule was thrown into chaos. 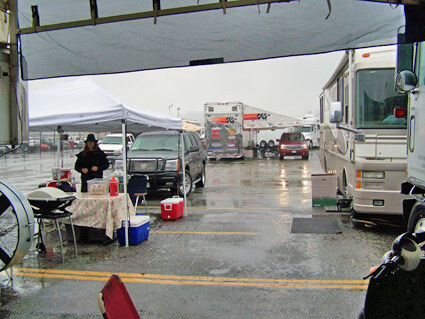 The pits at 10 AM Sunday morning. 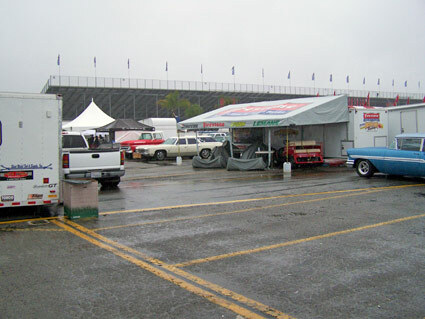 Incredibly the rain stopped by 11:30 and the track was race ready by 1 PM. 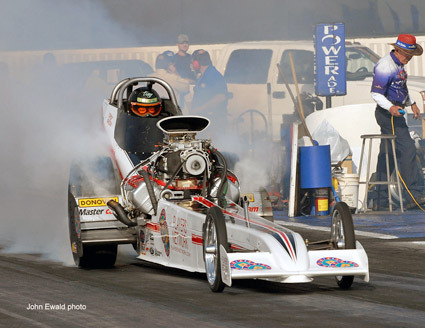 With a revised and much tighter schedule NHRA got the event run in record time that did not allow for the exhibition part of the show including the nostalgia cars. 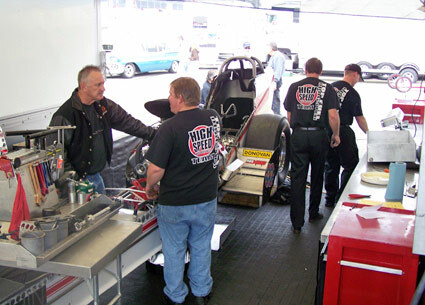 High Speed Motorsports weekend was over. 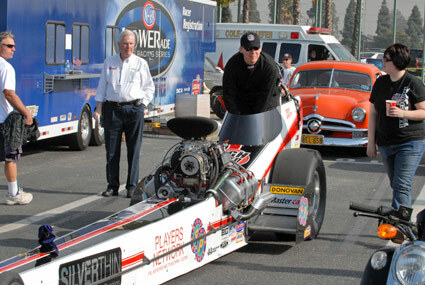 Blake and John Bowser were on hand all weekend to promote their upcoming March Meet at Bakersfield (see info link below). 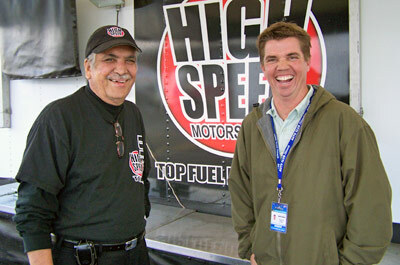 Here Blake and HSMS CEO Dale Singh share some pleasantries on Sunday afternoon. 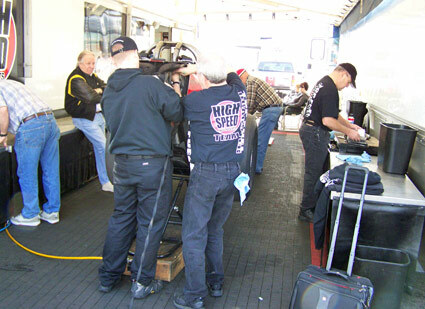 Tom Shelar guides the car with a dolly as the team prepares to load up for the trip home to prepare for the 48th annual March Meet.